Katie has worked in the financial service industry since 2005. 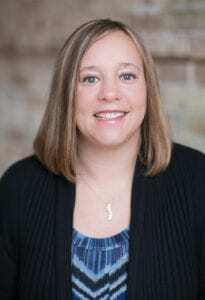 She assists clients with all of the stages of the financial planning process. Katie is graduate of the University of St. Thomas in St. Paul, MN. She and her husband enjoy family time with their daughter Kenzi, son Callan and dog Norde in Elk River, MN. “Ballast Advisors, LLC (“Ballast” or the “Firm”) is a federally registered investment adviser with offices in Minnesota and Florida. Registration does not imply a certain level of skill or training. Ballast and its representatives are in compliance with the current registration and notice filing requirements imposed upon federally registered investment advisers by those states in which Ballast has clients. Ballast may only transact business in those states in which it is notice filed, or qualifies for an exemption or exclusion from notice filing requirements. This material is limited to the dissemination of general information regarding the Firm’s investment advisory services. Accordingly, nothing herein should be construed by any client or prospective client as a solicitation to effect, or attempt to effect transactions in securities, or the rendering of personalized investment, tax or legal advice. Any subsequent direct communication from Ballast with a prospective client will be conducted by a representative that is either registered or qualifies for an exemption or exclusion from registration in the state where the prospective client resides. For information pertaining to the registration status of Ballast, please refer to the Investment Adviser Public Disclosure website, operated by the U.S. Securities and Exchange Commission, atwww.adviserinfo.sec.gov, which contains the most recent versions of the Firm’s Form ADV disclosure documents. Copyright © 2019 | Ballast Advisors. | OUR ADV | All Rights Reserved.